Lawyer Roberta Kaplan defeated DOMA at the Supreme Court. Eight questions for Roberta Kaplan about the fight for gay marriage. 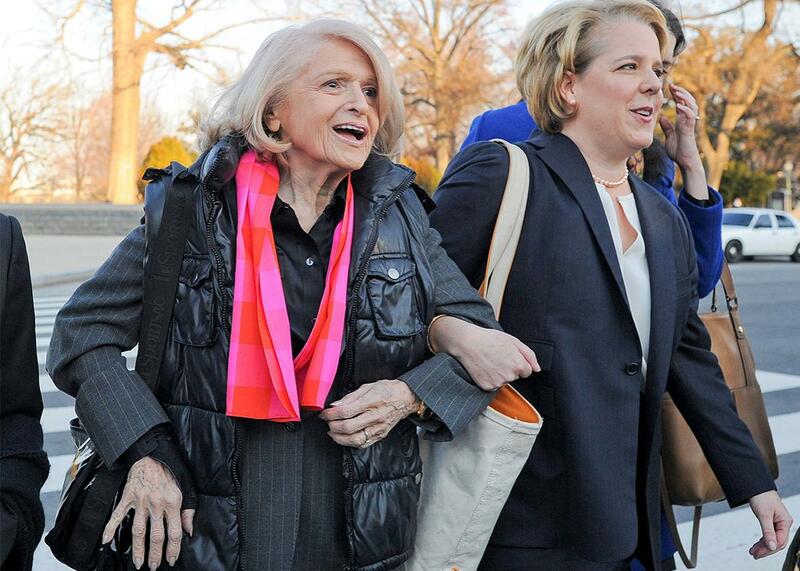 Edie Windsor, left, and Roberta Kaplan arrive at the Supreme Court on March 27, 2013, in Washington. Roberta “Robbie” Kaplan’s book, Then Comes Marriage: United States v. Windsor and the Defeat of DOMA, written with Lisa Dickey, was published by this month by W.W. Norton and Co. The book details Kaplan’s successful battle against the Defense of Marriage Act in the 2013 case that opened the door for the marriage equality decision this year. Kaplan’s account also explores the amazing relationship between herself and Edie Windsor, the plaintiff in the DOMA case. Robbie is a litigation partner at the New York firm of Paul, Weiss, Rifkind, Wharton and Garrison. She is currently promoting the book around the country. One of the most fascinating parts of the book, Robbie, is the myriad ways your life and Edie Windsor’s intersect. Despite your differences, the parallels are pretty interesting. That is surely true. There are a lot of parallels—we are about the same height, both Jewish, both stubborn, and both married in Toronto. One obvious difference is that I was never very good at calculus in high school, while Edie is a brilliant mathematician. Edie of course grew up and came of age at a time when anyone who was gay and was unwilling to live on the margins of society had to live completely in the closet. While that wasn’t true for my generation, going to college and then law school at the height of the AIDS crisis certainly contributed to my fears of coming out as a lesbian. This idea—what I now like to call “generations of lesbians”—is something I try to describe in my book. And then there is the truly incredible fact that 18 years before I ever laid eyes on Edie, I saw Edie’s spouse, Thea Spyer, who was a clinical psychologist, twice as a patient in order to help me come to terms with being gay. During those two sessions (which took place in Edie’s living room since Thea was already a quadripalegic), I remember Thea talking about Edie. While I understand it’s pretty unusual for a therapist to talk about her own personal life with a patient, looking back on it now, I think Thea assumed that the only way that she could possibly convince me that I too could have the kind of life I wanted was for her to tell me about her own relationship with a woman named Edie Windsor. It’s hard not to be struck by the parade of amazing women who march through the pages of your book, from New York’s Chief Judge Judith Kaye to Massachusetts Chief Justice Margaret Marshall; and on through your wife, Rachel Lavine; the incredible Edie Windsor; gay rights hero Mary Bonauto; and the wonderful Supreme Court Sherpa Pam Karlan. It’s like a who’s who of female awesome. In writing this book, it was very important for me to “lean in” on behalf of all the amazing women—gay and straight—who played such crucial roles. I think it is often much harder for women to talk about themselves or their own accomplishments. As a result, women’s contributions can get overlooked or underestimated in material ways. That certainly is what happened in connection with the struggle for LGBT equality. United States v. Windsor has to be one of the few landmark Supreme Court civil rights case where not only was the plaintiff a woman, but our entire team was run by women—Pam Karlan, Mary Bonauto, my law partner Jaren Janghorbani, myself. I really wanted to emphasize that in my book. You spend a lot of time in your discussions of litigation on marriage cases talking about the “accidental procreation” argument that you kept running up against. Why did this argument against marriage equality have such salience in the courts for a while? You can call it “accidental procreation,” though I much prefer to call it the “slutty heterosexual” argument. What this argument says is that it’s OK to offer marriage rights only to straight couples because only a straight woman can “accidentally” get pregnant. I think the reason our opponents seized on this theory is that it is really the only thing that differentiates straight couples as a practical matter. It is surely true—gay couples don’t have kids by forgetting to use birth control. Dan Savage rightly noted at the time this argument was first gaining prominence (approximately 2006) that it actually constituted a huge step forward for LGBT equality because rather than demonizing gay people as mentally ill perverts, judges were instead insulting straight people by saying that they were so irresponsible that they needed the protections of marriage. And while I can certainly see why society may want to encourage a young woman who gets pregnant by accident to marry the father of her child, I have never been able to understand why that woman would be more likely to do so because Edie Windsor couldn’t get married or had to pay a huge estate tax bill. You offer a pretty grueling view of what it was like for you and Rachel to do things so many American couples take for granted, such as taking your son, Jacob, home from the hospital and dealing with social workers in adopting your own son. Do you think these personal frustrations and slights fueled your own desire to litigate the marriage issue? While we were litigating the case, I tried very hard not to think about my own “stuff” (for lack of a better term) since I believe that my duty as an attorney is to think only of my clients and their interests to the exclusion of everything else. That’s part of the reason why I had a yellow Post-It on my computer that said, “It’s all about Edie, stupid,” as we were preparing our case for the Supreme Court. There is no question in my mind that our laser-like focus on Edie and her story played a huge role in helping us to win. part of me managed to seep out of cracks in the door that I had tried so hard to seal shut. You can hear it if you listen to the tone of my voice on a couple of occasions during my Supreme Court argument. In the end, I don’t think that was a bad thing for the case. I don’t think it escaped the Supreme Court justices that I was the first openly LGBT person to stand up in front of them in more than four hours of oral argument over two days in Perry [the California Proposition 8 case] and Windsor. I was fascinated by the fact that you met some resistance to using Edie as the face of the assault on DOMA because she was too much a “privileged rich lady” to engender sympathy. What did that suggest to you? Given the size of the tax bill that Edie had to pay ($363,000), I understand why some people were concerned that she might come across as “too rich.” But to be honest, it really didn’t trouble me at all. Particularly in light of Thea’s terrible disability and paralysis from multiple sclerosis, here was a couple who truly lived the words in sickness and health until death do us part. I also think every American gets in their gut what it means to have to pay a huge tax simply for being gay—exactly what DOMA was and did in these circumstances. My son is studying it now, and I’m pretty sure I too learned in elementary school that this country began because of a dispute about unfair taxation. And then, of course, we had the added bonus that many Republicans would like to get rid of the estate tax (which is the tax Edie had to pay) in the first place. Another fun theme in your book is the clash between the rarefied world of Supreme Court litigation and the scrappy New York litigation background you brought to the case. You even describe panicking a little after reading Elena Kagan saying that first-timers at the court should defer to experienced advocates. How did being an “outsider” help when it came to arguing Windsor? I think it would be fair to say that I panicked more than “a little.” Justice Kagan’s statement resulted in more than one sleepless night on my part (and as someone who often is asleep by 10 p.m., I am not someone who suffers from insomnia). We made every decision in the case based solely on one criterion—whether we believed it would help Edie to get her money back. That’s what I was taught to do as a “scrappy New York litigator.” I think it really helped us to filter out all unnecessary (and sometimes unhelpful) distractions. And while appearing before the Supreme Court for my first time in a case like this was more than a little intimidating, as a lawyer who practices in New York City, I have been up against a lot of pretty tough characters (adversaries and judges) during the course of my career, so it really didn’t feel that unfamiliar to me. Finally, I have to note that I love the phrase “scrappy New York litigation background.” All the great Paul Weiss partners of years past like Arthur Liman, Jay Topkis, or Marty London are surely smiling right now. One other clear thread in your book is the way your own Jewish life and background intersected with every part of this litigation—right down to having to argue Windsor at the 2nd U.S. Circuit Court of Appeals the day after Yom Kippur and a huge Passover Seder before the Windsor argument at the high court. How, if at all, does your religion impact your views on civil liberties and the Constitution? I think one mistake that our movement made earlier in the struggle was to cede the religious arguments to our adversaries. In other words, we allowed there to be the strong public perception out there that all religious people were against marriage equality. But that’s obviously not true—many religious people believe that every human being was created in the divine image, and that means that we all have equal dignity that needs to be respected under the law. I was obsessed with making sure that this viewpoint was fully expressed in the amicus briefs submitted on our side of the case, including the one from the Jewish Theological Seminary as well as many other mainstream religious groups. Moreover, as my friend and rabbi Jan Uhrbach has written, “authentic faith is grounded in humility, especially humility in the human attempt to understand the divine.” That kind of humility inspires the principles of religious freedom and pluralism so important in our Constitution. Those same principles also supported the idea that while religious groups can and do differ as to whether they will perform a religious wedding ceremony for a gay couple, it is not the place of our government to promote one religious view of marriage over another. You describe two moments from oral argument in Windsor that are so powerful. One is the reference to Justice Anthony Kennedy’s line that “times can blind” in a colloquy with Chief Justice John Roberts, and your closing observation about a new “moral understanding” that gay couples are no different. You characterize the gist of your argument as: “already married already gay.” You wanted the court to know the burden had shifted in part because the debate had already been settled out in the world. At what point did you realize that had happened? Looking back on it now, I actually think it happened during the case itself—it was as if things were moving at some kind of science fiction warp speed like in the comic books my son likes to read about black holes. When we filed Edie’s case in 2009, only five states permitted gay couples to marry, and that did not include our home state of New York, which did not enact marriage equality until 2011. In 2013, when I argued the case at the Supreme Court, only nine states allowed gay couples to marry. When the Windsor decision came down three months later, 12 states did. And when Obergefell was decided this past year, 37 states already recognized the equality of gay people in marriage. I like to think that my client and friend Edie Windsor had something to do with that.